FORMER Rustington Football Club manager Gareth Davies has hit out at the club’s relegation from senior football. Davies was Blues’ manager when the club reached senior football for the first time in their history, after they won Sussex County Football League Division 3 in 2007. 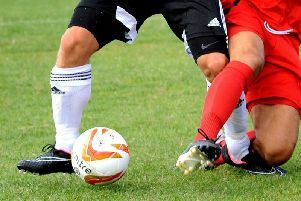 The following season, Rustington were unable to go up into Division 1 when they finished third in Division 2, owing to ground grading regulations as they do not have floodlights. Ground grading regulations have now seen Blues relegated from Division 2, along with Westfield, by the SCFL, after they finished fifth and fourth from bottom respectively. The bottom two in Division 2, Storrington and Seaford, will both stay up and Davies said: “I think it’s disgraceful the way that Rustington FC have been treated. “The FA’s ground grading criteria has been used as the reason. But Storrington, for example, by the FA’s criteria, have the same grading as Rustington. They finished below Rustington, yet somehow avoided relegation. “This decision is a kick in the teeth to the hard-working people at the club, such as John Virgoe and Trevor Waller. “It is obviously an issue around floodlights, yet Sidlesham have been promoted into Division 2 and I believe their floodlights haven’t worked for some years. “Langney have also been promoted with no floodlights at all, although I’m led to believe they are purchasing some. Davies added that he felt if The FA guidelines were being implemented, all clubs who did not meet the ground grading criteria should have been relegated – not just those without floodlights. He said: “If the SCFL want to go by the letter of the law, then they have to relegate all the clubs that don’t meet the grading, as detailed in the criteria. Davies now hopes that Rustington appeal against the decision and are reinstated into senior football. He said: “In terms of the way forward, I hope the club appeal and I hope the SCFL do the right thing and reinstate them into Division 2. “They need to make a consistent decision and give a definitive timescale for the implementation of the ground grading and that, when it’s brought into effect, it applies to everyone in every division, irrespective of your league position. “Rustington is a good club, has good people and has some of the best facilities within the league and certainly one of the best playing surfaces. “People behind the scenes want to improve the facilities and, speaking with the chairman and the management, I know they are passionate about doing it. “But these things take time and also money. Rustington has a football club it can be proud of, a strong link to the community and also youth football.